Hari Batti's Green Light Dhaba: Commonwealth Games 2010: History Rhyming? Missed deadlines continue to plague Commonwealth Games projects, and late rains are threatening to cause problems as well. With fewer than 90 days to go before the opening ceremony, organisers say there is nothing to worry about, but nobody completely believes that. From where I sit, it seems hard to imagine that everything promised will get finished on time. On the other hand, I think most of the essential stuff will be ready, because the government has invested too much in these Games to see them really fall apart. But what about the big picture? Nobody seriously believes we invested tens of thousands of crores over the last 5 years just to hold a "big, fat 14-day-long Delhi party." Our leaders have made more impressive-sounding promises than that: infrastructure improvements, tourism, and prestige, to name a few. 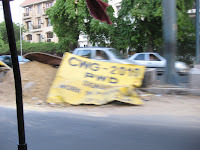 Yes, the CWG will make us a "World Class City." And the cost? It's always been assumed that the benefits would outweigh the massive expenditures. Perhaps Suresh Kalmadi, chairman of the Commonwealth Games Organising Committee, expressed this idea most clearly in February, when he told the Hindustan Times that the Games wouldn’t cost the government a penny: "The country will not incur any expenses. The money taken from the government is a loan, not a grant and will be returned. Our revenue from TV rights has doubled." As it turns out, according to the BBC, it seems unlikely that the CWG will meet the government's revenue expectations. But who knows, maybe they will pay other, less direct, dividends. After all, everyone knows there is never any shortage of countries offering to host the Olympic Games; there must be something to the idea that international sporting extravaganzas pay off. I decided to do some digging to find out how all this works. I found that the economics of international sporting events are seldom as simple as our politicians would have us believe. In fact, the issues are so complex, that very few people take the time to analyze the numbers. I did find one Candadian masters student in economics who used the lens of the 2010 Vancouver Olympic Games to look at this issue. After 61 pages of detailed analysis and graphs, he concluded, "the expected overall net benefit of hosting an Olympic Games is substantially negative." Looking back at the Vancouver Games, most non-economist commentators skipped the graphs, but conceded that the cost-benefit ratio was very difficult to figure. Vancouver’s first-term mayor, Gregor Robertson, put it this way: “Ultimately it will be years before you get a full sense of the balance sheet." infrastructure gets built that might not have gotten built otherwise. But sacrifices have to be made, as well; important things lose funding, because money is diverted to Games-related projects. It's economics and politics, just like everything else: there is a give and take. While I have argued that the CWG have served as an excuse to prioritize things like transportation and tourism over clean water and housing, one cannot deny the games have created a lot of jobs, albeit criminally low-paid ones. And I'm a fan of the Delhi Metro. That, at least, is something to say thanks for. But I'm sorry to say, there is no magic I know of that will insure the long term success of the CWG 2010. Politicians don't want to tell you that, and they never have. Not only are the long term benefits of mega-sporting events often hard to find, but sometimes, these events actually fail in very big and obvious ways. Back in 1970, Montreal Mayor Mayor Jean Drapeau confidently declared that "the Olympics can no more have a deficit than a man can have a baby." Those remarks reminded me a bit of Suresh Kalmadi promising the CWG won't cost the government a penny. Like Mark Twain, I don't believe history repeats itself, but sometimes it rhymes. Let's hope Delhi 2010 doesn't rhyme with Montreal 1976, because in spite of Mayor Drapeau's promise to the contrary, the 1976 Olympics turned out to be a financial disaster for that city! It took decades for Montreal to pay off the billion dollar debt it incurred preparing for those games. A bit closer to home, we can also hope that Delhi 2010 doesn't rhyme with Athens 2004, because a lot of people are beginning to think that the current financial meltdown in Greece was, in part, a result of the huge debt Greece ran up in preparation for those Olympics. Look, India's economy is bigger than Greece's and almost as big as Canada's, at least in nominal terms. We can probably absorb the cost of the CWG without a financial meltdown! But we've also got a few problems that Greece and Canada have never had. Like more than 800 million citizens living on Rs. 20 a day. Like 1250 people dying from diarrhea-related illness each day. Like 2,00,000 farmers desperate enough to kill themselves since 1997. These Games were a gamble; let's hope they pay off. But next time, I'd suggest we play our cards a little more cautiously. Let's bet on things we know we need. Things like food security, housing, and water. If we really want to go out on a limb, let's bet on something that will deliver long-term payoffs, like schools that will teach our children to read and to think before they go gamble money that they don't have on fun and Games! For more of what we've got to say about the CWG, check out our new CWG page.